Sealaska Heritage Institute (SHI) has rescheduled a lecture on armored warriors to Thursday, Dec. 1. In his talk, “Terrifying Visages”: Armored Warriors of the Northern Northwest Coast, Alaska State Museum Curator of Collections Steve Henrikson will show images of armor mostly housed in museums and cultural centers around the world. Some helmets were designed to inspire fear in the enemy, and the body armor was made of layers of material similar to modern bullet-proof vests, Henrikson said. “Fully dressed in armor, the warrior’s silhouette was concealed and appears larger than life—offering a psychological advantage. In the late 1700s, the Russian fur trader Alexander Baranov survived a nighttime battle with armored Tlingit warriors, calling them ‘terrifying visages’ and stating that their armor repelled bullets,” said Henrikson. The lecture will be preceded by two other talks scheduled this month. On Tuesday, Nov. 22, Southeast Alaska Native Veterans Commander Ozzie Sheakley will speak about Tlingit code talkers Mark Jacobs, Harvey Jacobs, George Lewis, Jeff David and Richard Bean and their Congressional Gold and Silver Medals. Sheakley will be followed by Judith Avila, who will provide the context of the work of code talkers through her lecture Code Talker—Looking through the Eyes of Navajo Marine Chester Nez (1921–2014). She will be accompanied by Chester Nez’s grandson, Latham Nez. On Tuesday, Nov. 29, Kai Monture of the K’iniex Kwáan will provide a lecture on training he received from his grandfather, George Ramos, who is an expert on Tlingit warriors. SHI and Sealaska are sponsoring the series in honor of traditional Native warriors and veterans. 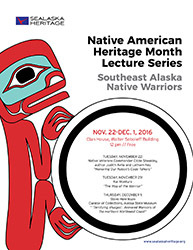 The lectures will be held from 12-1 pm in Shuká Hít (the clan house) at the Walter Soboleff Building in Juneau. The talks also will be videotaped and posted online. Ozzie Sheakley will speak about Tlingit code talkers Mark Jacobs, Harvey Jacobs, George Lewis, Jeff David and Richard Bean and their Congressional Gold and Silver Medals. Sheakley will be followed by Judith Avila, who will provide the context of the work of code talkers through her lecture Code Talker—Looking through the Eyes of Navajo Marine Chester Nez (1921–2014). She will be accompanied by Chester Nez’s grandson, Latham Nez. Kai Monture of the K’iniex Kwáan in Yakutat will provide a lecture on his training he received from his grandfather, George Ramos, who is an expert on Tlingit warriors. This talk will feature images of armor mostly housed in museums and cultural centers around the world. Henrikson has located nearly one hundred war helmets in museums and private collections, with new ones showing up every year or two. The helmets—elaborately carved with fearsome sculptures of clan crests, ancestors, and spirits—are part of a system of armor that protected the face, body and appendages. The armor was designed to protect warriors from traditional weapons: arrows, daggers, spears and clubs, many of which are elaborately decorated. By the 19th century, the armor became obsolete as high-powered firearms became commonplace, and war helmets were kept as sacred clan objects and worn and displayed at ceremonies. Richard Bean, Sr., was a well-known commercial fisherman from Hoonah. He was a purse seiner, crabber, troller, and halibut fisherman. In addition, Richard was an elder in the Hoonah Presbyterian Church, a lifetime member of the Alaska Native Brotherhood, and a member of Sealaska, Huna Totem Corporation, Juneau Veterans of Foreign Wars, and the Sitka American Legion. He served in the South Pacific theater during World War II. Robert “Jeff” David, Sr., was a well-known basketball legend from Haines. He was a member of the Gold Medal Hall of Fame, was a top fisherman, and was one of Sealaska’s first board members. Jeff was described as charismatic, confident, and outspoken. However, his son, Jeff David, Jr., says his father never talked much about his service in World War II, other than that he served in the Philippines for part of it and was in special services. Harvey Jacobs was a fisherman from Sitka. When he and his brother, Mark Jacobs Jr., joined the Navy shortly after Pearl Harbor, they skipped basic training and were put to work immediately on picket boats in Southeast Alaska and the Aleutians, and then in the South Pacific. Harvey was a Machinist Mate 1st Class in the U.S. Navy and was stationed on the USS Morrison (DD 560), but he was taken off the ship prior to it subsequently becoming lost off Okinawa. Mark Jacobs, Jr., was a well-known fisherman, leader, and historian from Sitka. He had vast knowledge of Tlingit culture and held positions in many regional and national groups, such as the Alaska Native Brotherhood, the Alaska Federation of Natives, the National Congress of American Indians, Central Council of Tlingit and Haida Indian Tribes of Alaska, and Sealaska. Mark served four years in the U.S. military, nearly all of which were in sea duty and in war zones. He served on the USS New Mexico in the Aleutians and on the USS Newberry and two years in the Amphibious Forces in the South Pacific. When he first joined the Navy with his brother Harvey Jacobs, they skipped basic training to immediately work on picket boats in Southeast Alaska and the Aleutians. George Lewis, Jr., was a boat builder, carpenter, and mill worker from Sitka. He was also active in silver carving, fishing, boxing, and carving totems and Tlingit helmets. In addition, George gave 45 years of service to the Salvation Army, was a lifetime member of the Alaska Native Brotherhood in Klawock and Haines, and was a fluent Tlingit speaker and storyteller. He served in the U.S. military in World War II. Sealaska Heritage Institute is a private, nonprofit founded in 1980 to promote cultural diversity and cross-cultural understanding through public services and events. SHI also conducts social scientific and public policy research and advocacy that promotes Alaska Native arts, cultures, history and education statewide. The institute is governed by a Board of Trustees and guided by a Council of Traditional Scholars and a Native Artists Committee. Its mission is to perpetuate and enhance Tlingit, Haida, and Tsimshian cultures of Southeast Alaska.